Pearson made many changes to the P26 over the production run from 1970 to 1983. This page is an attempt to illustrate as many of those changes as possible. I am still working on this page and will add more info, photos and drawings soon. If you have information that I can add to this please email me. The photo here shows the cockpit of a 1973 P26 (#671). This plan had a storage shelf for a fuel tank inside the port cockpit locker. Note the length of the engine well and that the two cockpit locker hatches are the same length. After 1975 (Hull #1000 according to Pearson drawing P-1690) the bulkhead at the front of the well (the traveler is located on top of it) was moved forward about 8 inches to enlarge the well. The older engine well may have trouble accommodating motors with larger power heads (e.g. Honda 9.9) when tilted up. The P26 in this photo has no stern rail and winches with old slot type handles. This photo shows the cockpit of a 1976 P26 (#1205). The cockpit of the P26 was modified from the original plan with the 1975 model. The fuel tank storage was moved from the port cockpit locker to a cubby hole type box at the aft end of the cockpit. 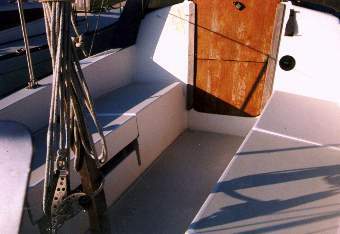 To accommodate this box the starboard cockpit locker hatch was shortened. The engine well was also enlarged. 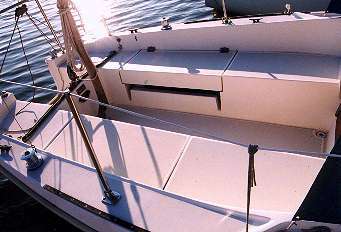 This boat has teak coaming caps (a Pearson option) a double stern rail, and double lifelines. 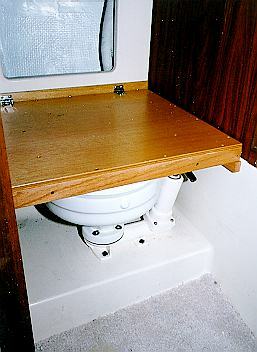 The OEM manual bilge pump can also be seen just ahead of the port locker. This photo shows the fuel tank cubby hole storage on the starboard side of the cockpit on a 1976 P26 (#1205). 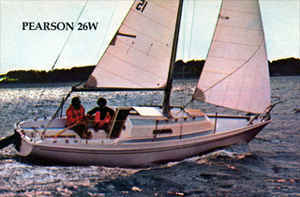 In 1975 Pearson introduced a variation on the P26 called the Weekender. 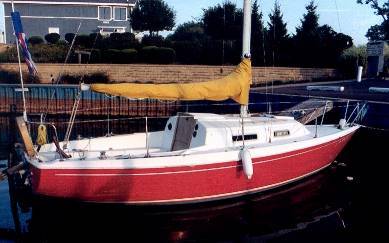 It shared the hull and rig of the P26 but had a longer cockpit and shorter, un-stepped cabin house and was 200 lbs lighter. The weekender was made for '75 and '76. 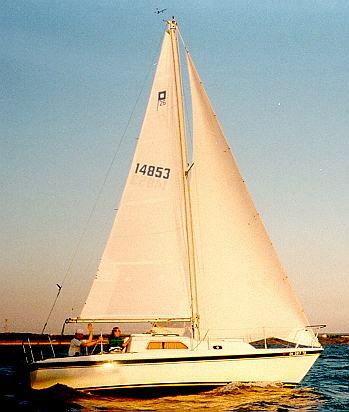 In 1978 Pearson re-named the Weekender the One Design and resumed production. The only difference seems to be two windows on the cabin side instead of the Weekender's one. The One Design also has the chainplates set about 4 inches more inboard then the standard P26 allthough I have seen One Designs with the same chainplate location as the standard P26. 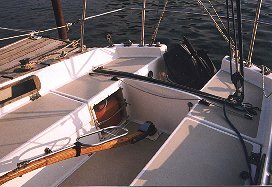 The cockpit of the Weekender and One Design is about 2 feet longer then the original P26. There is no cubby hole for fuel tank storage. Instead, there is a dedicated locker on the port side. This means there is only one cockpit locker. The engine well is the same as the standard P26 after 1975. This photo is 1981 P26OD #232. Note the lack of coaming boxes on this P26OD. The P26OD in the photos at the link listed below has coaming boxes at the forward end of the cockpit. 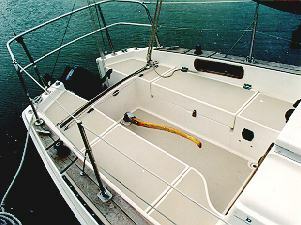 The companionway of the Weekender and One Design is not off center as on the standard P26. There is no cut out at the front of the starboard cockpit seat. The 1/4 berths extend under the forward cockpit seats. This photo is 1981 P26OD #232. At least one P26 was fitted with an inboard engine. This OD (#232) has a primitive looking sail drive unit about 3 feet ahead of the rudder. Most of the P26s were equipped with marine heads. Later models and the Weekender/One Designs had optional portable toilets. For the portable option Pearson added an extension to the floor area where the head mounts. The molded floor pan is extended out to the edge of the door, about 6 inches. The extension is a fiberglass unit that is screwed in place. The extension was added to accommodate the larger footprint of the portable toilet. Portable units are available today that have smaller footprints and will more easially fit the OEM space for the marine head. First P26 built in Portsmouth, RI. Pearson assigned an ID number to all models. This number is the first two digits of the serial number. The P26 model ID number was 46. The original base price was about $6,900. This note appears in a P26 document, I don't know what it refers to. 6/19/74 - Note on Pearson drawing P-1680, "ENLARGED OUTBD WELL HULL 1000 & UP, REDUCED STBD SAIL LOCKER"
Fuel tank shelf in port cockpit locker removed, cubby hole location for OMC 6 gallon tank added at aft end of cockpit on starboard side, starboard locker hatch shortened to accommodate. Engine well enlarged, traveler mount location moved forward about 8 inches. 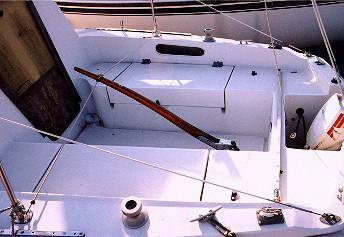 Reference made to old style lifelines on hulls 1-650 in Pearson Yachts Parts Catalog 1-1-75. First Weekender model (P26W) listed in BUC. Longer cockpit (about 9 feet) and shorter unstepped cabin house. 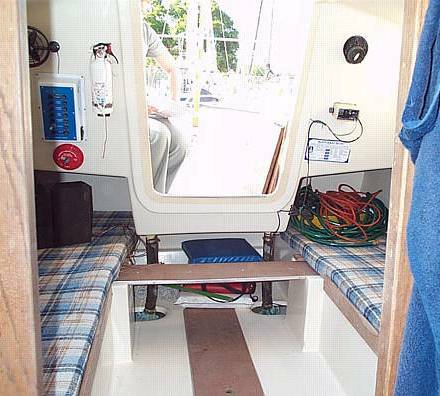 Interior had two 1/4 berths (really midship), and a curtain separating the forward sections (head & V berth). Same hull and rig. The P26 Weekender model number was 55. One Design model introduced. This is the same as the previous Weekender with two cabin windows instead of the Weekender's one. The P26 Weekender model number was 60. Plexiglass doors added to enclose outboard shelves in main cabin. There is some confusion about hull numbers. Pearson reported 1774 boats built but there is a boat with hull number 1781. Perhaps some hull numbers were skipped. #1781 is listed as a 1979. There is a 1981 on my list with hull number 1700. I was told by the owner of 1781 (who bought it new in 1979) that his insurance company informed him that Pearson hull numbers got "messed up" when they had two factories. I have another listing of a 1982 with hull number 1766. Something is certainly wrong somewhere. 4 TOGGLE, chrome-plated bronze, 3/8"
1 TOGGLE, chrome-plated bronze, 7/16"
4 TURNBUCKLE, chrome-plated bronze, 3/8"
1 TURNBUCKLE, chrome-plated bronze, 7/16"
2 SHROUDS, UPPER, 3/16 s/s wire, 29' 9"
2 SHROUDS, LOWER, 3/16 s/s wire, 15' 6"
2 SHROUDS, LOWER, 3/16 s/s wire, 15' 10"
TOPPING LIFT, 1/8" wire and 7' of 1/4"
Rudder bushing change at hull #1417. Masthead, mast extrusion and mast step change at hull #1128. No info on what the change was. Roller reefing handle change at hull #772. Up to 771 it's a #1200 RR, 772 and up it's a Nicro Fico #101. New style gooseneck starts at hull #1520. Here are some of the optional accessories available in 1979 and the prices in the catalog. What do you think of my WWW pages? Email me with you comments.